Deborah MacLatchy has begun her new role as president and vice-chancellor of Wilfrid Laurier University. She succeeds Max Blouw, who completed his second five-year term on June 30. MacLatchy is Laurier’s seventh president and vice-chancellor since the university became a public institution in 1973. 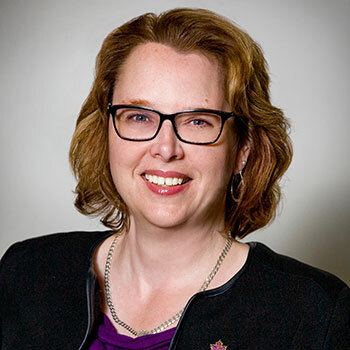 A distinguished biologist with extensive experience in research, teaching and administration, MacLatchy served as dean of Laurier’s Faculty of Science from 2007 to 2009 and as provost and vice-president: academic from 2009 until 2017. Previously, she spent 13 years at the University of New Brunswick where she was dean of Science, Applied Science and Engineering, and director of the university’s International Office. MacLatchy holds an honours BSc from Acadia University and a PhD in zoology from the University of Manitoba. She is a founding fellow and past chair of the science directors of the Canadian Rivers Institute, and is a past-president and council member of the Canadian Society of Zoologists. MacLatchy’s appointment as president and vice-chancellor was first announced in January 2017. She was selected following a nine-month search process. Her appointment was recommended unanimously by the university Senate and approved unanimously by the Board of Governors. Her five-year term runs from July 1, 2017 to June 30, 2022.